Who Is Disrupting Pakistan’s Peace Talks With Taliban This Time? Back in May, the CIA chose to take out Wali Ur Rehman in a drone strike that appeared to be follow-through on their vow to take revenge for his role in the bombing of the CIA outpost in Khost. As I pointed out on the day of the strike, the revenge killing came at a particularly sensitive moment, as Nawaz Sharif had been elected to head Pakistan’s new government but had not yet even taken office. Sharif had run on a platform that included a promise to enter into peace negotiations with Pakistan’s Taliban group known as Tehrik-i-Taliban Pakistan or the TTP. As could well have been expected, the TTP announced the next day that they were withdrawing their offer to take part in talks. A senior Pakistani Taliban commander has welcomed the government’s recent offer to hold peace talks. Asmatullah Muawiya said in a statement Thursday that Prime Minister Nawaz Sharif demonstrated political maturity by reiterating his offer to hold peace negotiations in a speech over the weekend. Muawiya said militants in Pakistan should respond positively if the government is serious about resolving the conflict. A Pakistani Taliban commander believed to be harbouring foreign militants was killed along with four others in a roadside bomb explosion in South Waziristan tribal agency, officials said Thursday. Ghulam Jan, believed to be a key commander of the outlawed Tehrik-i-Taliban Pakistan (TTP), was killed along with four accomplices when the improvised explosive device targeted his vehicle on Wednesday evening in Birmal tehsil, located about 27 kilometres from Wana, the main town in South Waziristan. Assistant Political Agent Shahid Ali Khan confirmed that five people were killed in the blast which completely destroyed the vehicle. Okay, this time it was an IED and not a drone, so we can’t immediately put blame on the CIA. Also, the Dawn article goes on to note that a pro-government faction has been fighting the TTP in that region for five years or so. Even with those caveats, we are left to wonder whether the CIA and/or ISI had a role in choosing both the target and the timing for this particular attack, since those two groups have shown in the past that they prefer violence over peace talks and are not afraid to take steps to disrupt talks. At any rate, it will be very interesting to see if today’s bomb manages to block the current move toward negotiations. https://www.emptywheel.net/wp-content/uploads/2016/07/Logo-Web.png 0 0 Jim White https://www.emptywheel.net/wp-content/uploads/2016/07/Logo-Web.png Jim White2013-08-22 08:42:172013-08-22 08:42:17Who Is Disrupting Pakistan's Peace Talks With Taliban This Time? Suicide Bomber in Khost Targets Biometric Screening Checkpoint? A suicide bomber struck a security checkpoint in Afghanistan’s city of Khost on Wednesday, killing at least 16 people and wounding 30, police said, the latest attack to raise questions about stability in the volatile eastern region bordering Pakistan. A witness said that NATO and Afghan troops were using biometric data to screen residents of the provincial capital when the bomber struck. With a high-capacity storage of up to 22,000 full biometric portfolios (two iris templates, ten fingerprints, a facial image, and biographic data), L-1’s HIIDE Series 4, or Handheld Interagency Identity Detection Equipment, is receiving praise for its functionality and appeal to Afghanis wishing to have proper identification that would distinguish them from suspected terrorist in question. The HIIDE is the world’s first hand-held tri-biometric system that allows users to enroll and match via any of the three primary biometrics: iris, finger and face. The intuitive user interface makes it easy to enter biographic data to create a comprehensive database on the enrolled subject. The HIIDE provides complete functionality while connected to a host PC or when operating in the field un-tethered. 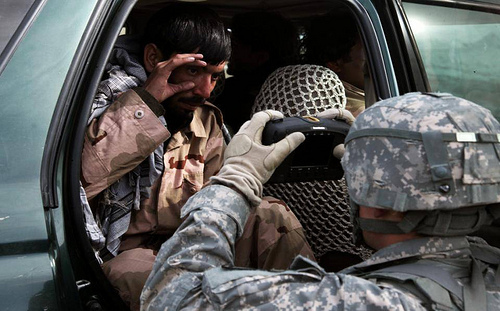 The featured biometric technology is presently being used in a ring of security checkpoints around Kandahar City in Afghanistan, where Canadian operated bases are also being equipped with it. The enrollment procedure is voluntary and takes approximately six minutes to complete. All the biometric information is sent securely to the database of ISAF, NATO’s International Security Assistance Force. https://www.emptywheel.net/wp-content/uploads/2016/07/Logo-Web.png 0 0 Jim White https://www.emptywheel.net/wp-content/uploads/2016/07/Logo-Web.png Jim White2012-06-20 09:54:562012-06-20 10:54:15Suicide Bomber in Khost Targets Biometric Screening Checkpoint? As described by Robert Baer in his description of the utter failure of tradecraft in the Khost bombing, the loss of tradecraft in the CIA started when it was under the direction of John Deutch (whom I think of as likely Clinton’s worst appointment and entirely inappropriate for the job), but as Baer described, the massive expansion in CIA activities post 9/11 with so few properly trained field agents contributed even more strongly to the current shortage of tradecraft. But it is not just within CIA where a massive shift in actions and priorities occurred post 9/11. Consider what has been put forward just in the past few months from the FBI and NYPD and it is easy to see that here, too, a “rush for immediate results” has hurt the fight against terrorists, producing laughable arrests while missing real threats.